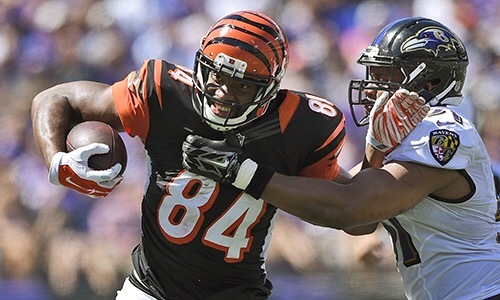 There are questions, fair ones, about what tight end Jermaine Gresham will bring to the Cardinals now that he has agreed to a one-year contract. (With the roster already at 90, the Cards will have to release someone once Gresham officially signs.) But as usual with GM Steve Keim’s prove-it deals, there is very little downside to make the move and the potential of real upside. Assuming Gresham is healthy after back surgery — and he would’ve had to have passed a physical already — he gives the Cards a receiving target that has done it in the NFL, which the Cards did not have on the roster. It gives the Cards experience, period, which the Cards didn’t have. Plus, he played some with Carson Palmer, and while Gresham has had issues with consistency, Palmer is the type of leader that can help in that regard. As of now, it’s hard to imagine Gresham not as starter assuming he plays as expected. And thus far, these kinds of Keim signings — Winston, Abraham, Dansby, Cromartie — have turned out pretty well. He’s graded out below average in 4 of 5 seasons in the NFL, including each of the last 3. He was a little better in 2014, but he ranked 61st out of 62 eligible tight ends in 2012 and 64th out of 64 eligible in 2013.
b2bsing: Not sure which rankings you are talking about, Gresham is a 2 time Pro Bowl TE who had a pretty solid season last year with over 60 catches and 5 touchdowns. I believe he is actually an upgrade over Carlson if he can stay healthy. Arguably the best TE available at this time. His previous work with Palmer can be helpful but I wonder how long it will take him to learn the intricate offense the Cardinals have in place. He has all of training camp to study the tapes and work his routes so hopefully he’ll get it all down by game one against the Saints. Good signing again by Keim & Company. Jermaine Gresham is a very nice addition to our already potent squad. Troy Niklas and Darren Fells are locks to make the roster. This is the problem: I like our other two TEs Gerald Christian and Ifeanyi Momah. Momah has very good size at 6’7” and has the speed to back him up. He is more of a pass catching TE than a blocker but he already has made big strides. Christian is our rookie TE that is a built blocker and still has so much potential that Bruce Arians likes in his TEs. Gerald Christian in my opinion was the biggest steal in the bottom half of the draft. I really thought he would be a 5th or 6th Rounder but in terms of what Arians likes, he is worth at least a 3rd Round Pick to Arians. Has similar traits to Niklas in terms of physique. If Momah is PS eligible, I’d sign him. He has a very good shot of making the roster next season but still has an opportunity this season. My guess, Ted Bolser or Gannon Sinclair will be released as soon as Gresham is officially a Cardinal. Decent signing. Not sure where previous poster is getting his info though. Gresham graded out as 3rd best blocking TE last year. Has avg 50+ catches over his 5 year career. He will pick up the slack of Carlson’s retirement and give the TE room a vet leader. Overall a + signing from the FO/SK. Even if Greshem passed a physical, recent back surgery and herniated discs are not something that just resolve and go away, and most neurosurgeons would tell a patient not too engage in “pounding activities”, i.e. major red flag, kinda like buying a race horse with a bad leg, don’t expect him to win anything but could be a good stud. The upside is hopefully he will provide a veteran presence in the TE room and some of our current TEs will see this as a signal to go all in. It’s only a one year contract so hopefully we will get our money worth (although I think it could be better spent on defense). I know a big selling point for Greshem with the Cards was suppose to be his history with Palmer but depending on who you talk to in Bengal land this may have been slightly embellished as he seems to have been pretty inconsistent. On the other hand, I don’t think our fans understand that BA’s scheme is different from others in the way TEs are utilized and even Jimmy Graham would likely see a drop off in numbers with the Cards. I don’t look for any great things here and see this more of a way to appease fans who wanted a catching TE. I, personally, would rather see us build a tougher, nastier and bigger defense with a Tom Moore-type “consultant” to help our new DC with the play calling genius and ingame adjustments that Todd Bowles brought to the Cards. I like the improvements we’ve made on offense but the Card defense has carried this team for the past two years and now is not the time to be left wanting. Teams are going to be thinning the herd soon and there is still time to pick up some legitimate talent and step things up defensively. Certainly worth a look at camp. I don’t see him making the final 53, enjoy the competition though. The Cards should have some great stories this summer. He is a very good addition to an already potent offense. Remember, he had Andy Dalton throwing him the bal for the last four yearsl. Needs to hang on to the ball. Best offense since the Cards move to the Valley. Balance,Balance, Balance! We will be in the upper half of the league in rushing this year. Great receiving bunch with depth. Our defense will be just fine. Arains had a succession plan for Bowles departure. In Arains and Keim we trust. Stoked for start of season. Super Bowl or bust if and a big if that we stay relatively healthy!!!! I agree. I am somewhat guarded about how effective he can be this year coming off of major back surgery. It was certainly worth the risk to bring in Gresham based upon his potential upside. Let’s hope Keim has nailed it again! That’s a lot of baggage to take on, especially with the DWash situation still ongoing. I see why people are interested in bringing in Junior Gallette. He is fast and has averaged over 10 sacks the past two seasons. -Secondly, we drafted Markus Golden in the second round for a reason. If we were to sign Junior Gallette to a 2-4 year deal, that just makes us stupid in our part because we wanted Golden to potentially be our future starting OLB. Then why in the world did we draft him if we are never going to give him a shot at the starting job? -Third, I think people should see the Arizona Cardinals tactics in signing & drafting players. We signed Sean Weatherspoon, Jermaine Gresham because they had decent NFL careers thus far and the Cardinals believe that their hunger to bounce back from their injuries will propel them to a higher playing level. We drafted Markus Golden a bit early because he displayed good explosiveness at Missouri, he is one heck of a hard worker, and he is eager to show that his high draft spot was well worth it. We got Rodney Gunter, JJ Nelson, David Johnson because they are very good depth players and their potential is very high. Coming from small colleges, their desire to exceed expectations gives our team a new fire that any NFL team will have trouble facing. -Junior Gallette will likely demand too much but if he wants to prove that he is a player worth trusting, Steve Keim signature one year prove it deals will give him that opportunity. Gallette might want to come here because we play his former team Week 1. But if this were to happen, guys like LaMarr Woodley or Lorenzo Alexander would eventually have to be cut. OK, Gresham is on board. Yes, a solid veteran TE and one that we know can catch some balls, make some plays. I’m fine with that. BUT…. It’s not the recent history of Jermaine Gresham that is the issue here. It is the recent history of how THIS team has utilized the TE position that is the issue, IMHO. Because if we run the offense the same way, well….is it gonna matter? Is it gonna matter if it’s Gresham or Fells or Niklas or Carlson or Dray or any other player who has played TE for this team in recent memory? Can’t keep plugging in different guys, running the offense the same way, and hoping for different results. I think we know that by this time. That said, I CAN at least get a little excited about what Gresham appears to offer when he is healthy. And BTW, doesn’t it seem like that little disclaimer it being attached to the names of an AWFUL lot of Cardinals players these days??? Gresham….Palmer….Weatherspoon….Zastudil…..
And if nothing else? Gresham is a lot better than Chris Cooley. I swear, has this been THE longest off-season ever??? It sure seems like it has. Maybe that’s because for Cardinals fans, last season effectively ended while it was still going on. ANY chance we had was snuffed out when Stanton went down. So, it REALLY seems like it’s been such a long time since the last game that was meaningful AND that we had a snowball’s chance in hell of being competitive in. 2015 can’t start soon enough! Agree with what you are saying about Our offense and tight ends. But we have to remember we haven’t had any reliable ball catchers at the TE position. John Carlson was not the John Carlson that had 800 yards with Seattle. Gresham is much better than him and I think we can utilize him well in the red zone and other situations. Still think Niklas deserves a better shot but I like where we are going for this season. If only D Wash was back! But did John Carlson have the chances here that he had in Seattle when he was having 800-yard seasons? Never mind, don’t bother responding to that. I just need to let the whole TE thing go! I’m getting entirely too hung up on it. But thanks for your reply. Yes, overall, I am more than OK with a guy like Gresham. I’m sure we CAN utilize him in the red zone and other situations. Whether we WILL or not…..remains to be seen. I hope we do. Because if healthy, Gresham clearly offers that. Geez, I hope he doesn’t come here on a one-year deal and pull a Karlos Dansby on us. One good year for the Cardinals, then it’s out the door to cash it in somewhere else! So does anyone get the ball enough for you Scott? Weren’t you just making a big point that The Cards don’t force the ball to Larry enough? With Floyd, Fitzgerald, and both of the Browns, Ellington who catches the ball well and then drafting another running back who catches the ball well. I’m trying to grasp how you can draw up such a playbook to get everyone so many touches, and run the ball successfully. Do I think the Cardinals under-utilize the TE position? Yes. If you disagree with that, then please present the evidence to the contrary. And BTW, I never made a point that the Cards don’t force the ball to Fitz enough. And I’ve clarified that a hundred times if I’ve clarified it once. Because what I DO believe is that they can ( and should ) increase how often Fitz is targeted and I don’t think they have to “force” the ball to him to accomplish that. In years gone by, when Fitz had much better numbers across the board ( targets, catches, TD’s ), were we “forcing” the ball to him then?? How do you draw up such a playbook to get everyone so many touches and run the ball so successfully? Well, first, I’m not sure what “so many touches” means. Fitz doesn’t need 200 targets to be targeted more than he was. We don’t need a TE to become the leading receiver on this team to make that position more productive than it has been. And in regard to Ellington, well, you tell me – where did all the touches we gave him last year get us? He was cooked after 2/3 of the season. Perhaps more balls going to Fitz ( OR Floyd ) or to the TE’s would have helped Ellington last a little longer. How do the Broncos do it if it can’t be done? How do they have 2 WR’s and a TE putting up monster numbers while they also run the ball successfully? And the Pats? They spread the ball around to everyone yet look at the numbers that Gronk and Edleman have. Gronk was a beast last year and Edleman had over 100 receptions. How do they do it if it can’t be done? BTW, they also won the SB, so…it’s not like that way of doing things doesn’t work! With all that said, I think we all know ( certainly, we all HOPE! ) that with Palmer healthy for a whole season, the offense is more productive and everyone’s numbers are better across the board. And, yes, maybe that will even include one of our TE’s. And if it turns out that way, you ain’t gonna hear any complaints here! B. It’s hard to present evidence on a tight end in a scheme that uses there tight ends as blockers. C. Was Ellington cooked? Leaving camp with a foot injury and still getting 660 yards last season. D. BTW. They the pats also cheated. F. I believe you watch to much football to understand the difference between all the offenses you have mentioned. The Pat’s have Tom Brady and the Broncos have Peyton Manning. The Cards have the most okayest Quarterback in the league. We’re talking Elite Vs. Functional. G. Are you one of those people that talk to hear themselves talk? Yes, I know Fitz led the team in receptions. So? Still a very modest total for him. He also had only 2 TD’s. THAT is using Fitz adequately? But we both know he was affected by the QB situation. Evidence on the TE’s….geez, I thought you would at least put some effort into that. So, allow me – I went 86 players deep on the list of receiving leaders. leaders from 2014 and had not yet found a Cardinals tight end. Yeah, I know the TE is primarily a blocker in this offense. Thanks. As others have noted, then why do they bring in so many TE’s every off-season? And why bother with Jermaine Gresham if all he’s gonna do is block? Ellington – IMHO, he was cooked. We don’t have to agree on that. But there is no shortage of opinions that Ellington is just not physically up to the workload he had last year. Pats cheated….really? They didn’t need to cheat to beat the Colts. And that is a shame, but….that’s a whole different story that has nothing to do with this. They also did NOT cheat to win the SB. Jermaine Gresham may have been the best TE available at THIS point. Does that mean he was the best one available in FA? At this point….who cares? But I direct your attention to the Seahawks, who didn’t just limit themselves to who was available as a FA. Sorry to hear that your opinion of Palmer is so low. Maybe I beg to differ. No, in the grand scheme of things, Palmer is not the elite QB that Brady or Manning is. That is hardly a stunning revelation. Then again, over the last two seasons, ONLY Brady, Manning, and Russell Wilson have a better winning percentage than Carson Palmer. Hmmm…sounds like pretty elite company to me. Whatever. I see Palmer as more than merely functional. You see it differently. Doesn’t mean you’re right, I’m wrong. No, I don’t enjoy hearing myself talk. What I DO enjoy is a good debate that goes back and forth. And I thought that was part of why we come here in the first place. I seem to enjoy your input more than you do mine. Hey, whatever. Now that I answered your question, here’s mine – are you one of those people who likes to tell other what they already know?? First, what is utilizing our TE ? Was Julius Thomas utilized? Most would say yes. Yet he had 43 catches and under 500 yards (not Gates and Gonzo type numbers). But where he was deadly was the redzone putting up 12 TDs. So to Scott’s point, if Gresham/Niklas/Fells are used in a 2 TE formation with Fitz and Floyd outside, it would seem there will be opportunities to get them the ball inside, or find one on ones with Fitz/Floyd. I’m OK with 60 catches and 600 yards from all three TEs as long as they catch first downs and TDs. 10 TDs from our TEs would be nice to see. I also agree with Scott that (like the Broncos who had 2 receivers over 1400 yards and 100 catches) Fitz should be able to bring in 80 catches for 1100 yards, while John Brown catches 70 balls for a 1200. There really isn’t a reason they couldn’t each have a 1000. The Broncos used 4 different backs to also rush for over 1700 yards. There is again no reason why our backs can’t rush for 1400+ yards. Where I do see the cards being better than the Broncos is our backs will catch more balls for more yards. Although Palmer is not Peyton, I can’t see why he couldnt have a couple 1000 yard wrs, 2 backs to combine for 1400 rush yards, and 3 TEs to catch 60 balls for 600 yards. That is not far fetched and I think that is what Scott H has been saying on this board forever. Correct me if I am wrong Scott. Hey, where you been, man?? Good to have you back! I feel like I haven’t heard from you in a long time. As always, your input is appreciated. – 32nd – DEAD LAST – in TD’s from a TE with ONE. Yes. ONE! So, Bob, if you’re still there….give me a break if you think my “complaints” about the utilization of the TE are un-reasonable. Never mind my opinion. LOOK AT THE NUMBERS. They’re right here and they support that fact that the Cardinals are one of the lowest TE-utilization teams in the NFL. And I’m sure you knew that. I just don’t understand why it never changes, year after year. Not just last year or the last few years, but the last many, many years! Sorry, I guess I just have a hard time accepting certain things being as they are. John, I hope you enjoyed the numbers. I know you appreciate when people bring some facts to back it up!